Her name has become synonymous with fresh-pressed napkins, home-cooked meals and "Martha Stewart" living. But for years, Martha Stewart said she struggled to run her home goods empire and manage a picture-perfect home life at the same time. 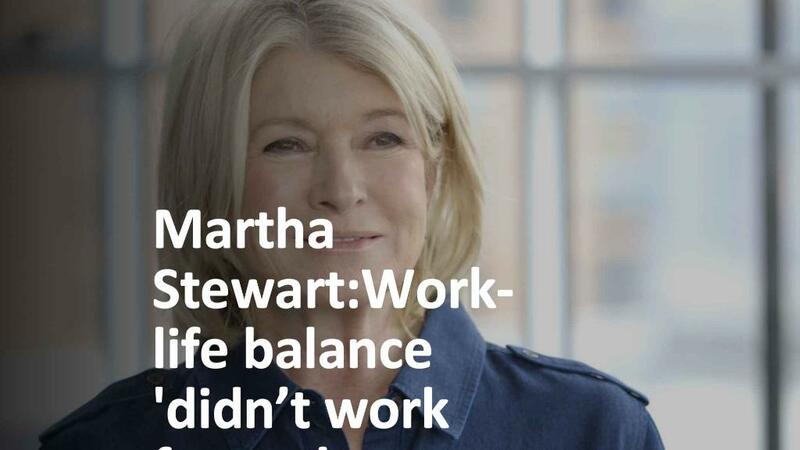 In a video interview with CNNMoney's Christine Romans, Stewart admitted she could never find a way to perfect that mythical "work-life balance." "It's one of the most difficult things to do, that balance, which is so elusive to most of us," she said. "It didn't work for me. I thought, 'Oh, I can do it. I can do all of that.'" When her 29-year marriage ended in 1990 (the same year "Martha Stewart Living" magazine launched), she was just beginning to make a name for herself in the lifestyle world. Stewart said she paid the price for her mistaken confidence -- but one she doesn't regret. "I had to sacrifice a marriage because of the lure of the great job, the fabulous workplace," she said. "But, I don't regret it at all, because what I've done is something bigger and better than just one marriage. ... People who are happily married, don't hate me for saying that. But for me, it's true. It's impossible for most of us to get that balance." For years women recoiled at the idea of spending even more time in the home, tinkering with recipes or decorating an immaculate dinner table. But Stewart insists that her leadership in homemaking is rooted not in "perfectionism" but in "living better." She sees her Millennial viewers prioritize lifestyle goals alongside career goals. According to a 2015 study of female Millennials by PwC, the phrase "work-life balance" matters to younger women workers more than ever before. Around 97% of those women surveyed said that work-life balance was important to them, and 55% of respondents said "the work demands of their current role significantly interfere with their personal life." Martha sees this focus on work-life balance as part of a "counterculture" energizing the world of homemaking. "They want to be good mothers. They want to be well-dressed. They want to have beautiful homes," Stewart said of her younger fans. A counterculture in more ways than one -- when Romans asked Stewart about her thoughts on the recent national reckoning on sexual harassment, Stewart said she wishes more women had come forward years ago when they first experienced harassment. "I think it would have been better to call [harassment] out originally, instead of 15, 20 years later," she said. "That women were meek or timid in the workplace 15 years ago, and waited until now to call out ill behavior and inappropriateness in the workplace, is a problem." Stewart mentioned that in her past jobs, she would often confront male colleagues for inappropriate behavior in the workplace. "I called them out. I remember saying, 'Stay away from me, creep,'" she said. "But you have to feel good about yourself in order to behave [toward harassers] in the way that you deem appropriate."